Senior members of the CIfA prepare to cast the trowels at Stonehenge in thePipeLine’s annual effort to predict the most important developments in archaeology and heritage for the year to come. Once again thePipeLine has been able to eavesdrop as a senior group of skyclad Members of the Chartered Institute for Archaeologists [MCIfA’s] gathered at a sacred site in southern England to cast WHS Archaeologist’s trowels into the embers of a dying midwinter fire in an attempt to forecast the most important developments in archaeology and heritage for the year 2016. We must admit the results of last year’s predictions were somewhat ambiguous, therefore we appointed an ethics committee drawn from supporters of the CBA and CIfA, to oversee what has now become an annual experiment. After long deliberation, coupled with a consultation with Historic England Guidelines [which took even longer], the committee decided that a more sacred spot than the car park closest to the Miller Building of Reading University, the home of the CIfA, was required to stage the ceremony. So it was that at dawn on the Mid Winter Solstice the members of the CIfA psycho-archaeological research team gathered in the Stonehenge World Heritage Site, at the spot which will become eastern approach ramp of the Stonehenge [short] Tunnel, as re-announced by the Department for Transport and the Highways Agency and endorsed by Historic England and the National Trust. The ceremony commenced with an attempt to channel the genius loci as well as the spirits of Sir Mortimer Wheeler, Alfred Watkins and Aleister Crowley. The remarkable team of eminent archaeologists and folklorists who were the originators of the first secret experiment in archaeology and parapsychology undertaken by the Society of Antiquaries and the Dorset Field Club in 1935. As a Tawny Owl hooted in the distance and the screams of mating hedgehogs filled the night, the chosen MCIfA seers poured libations of Wadworths 6X, chanted the names of the original members of the “Time Team” to all four points of the compass and speaking in various ancient tongues began their predictions as to what might befall archaeology and heritage in 2016. For the first prediction the team entered what seemed like a trance and took the form of a Morris Dance side wearing horns made from discarded copies of the London Standard newspaper, and as they danced the following vision was reported. And lo Thomas Hetherwick and Joanna Lumley shall arrive at the South Bank in an overheating New Routemaster Bus [designed by Thomas Heatherwick] and shall lead Boris Johnson and George Osborne, followed by the owner of the London Standard and a procession of very kind and generous rich people, unto the middle of the River Thames to inaugurate their generous gift of a Garden Bridge [designed by Thomas Heatherwick]. Whereupon, amid a great grinding and gnashing of teeth and a Metropolitan Police Investigation [allegedly], as well as at the saving of £60 million quid of public money which can be spent on Kew Gardens and real public parks, the Garden Bridge shall dissolve into a great steaming pile of, absolutely fabulous, ordure, which shall sink into the river and thus restore the historic downstream view of St Paul’s Cathedral which was known unto Canaletto and generations of Londoners [but not unto Historic England’s Historic Environment Impact Assessment]. And the angry shade of Sekhemka shall yet stride the blasted earth of Northampton [and the corridors of the Department for Culture Media and Sport] and his curse shall yet blight the career of David Mackintosh MP and all who touch him [especially at the section of the DCMS which deals with cultural diplomacy between the UK, Egypt and Qatar]. But then Northampton Borough Council shall miraculously recover the £10.25 million loan foolishly given away without due diligence by Mr Mackintosh unto the developers of Northampton Town Football Club, which was spent we know not where, and shall compensate the anonymous buyer of Sekhemka according unto the terms of the Temporary Export Ban. Whereupon Sekhemka shall return in triumph unto Northampton Museum and the five years of cursed blight brought down upon Northampton by Arts Council England and the Museums Association shall be lifted and Mr Mackintosh shall claim the credit in the Northampton Chronicle and Echo. But part of the curse shall yet remain because, like Cassandra, no-one will believe a word Mr Mackintosh says. As the shade of Sekhemka dissolved into the mist the ground appeared to rear up and take the form of the mighty Old Oswestry hillfort bestrode by the titanic figures of Lord Renfrew, Sir Barry Cunliffe, Dr George Nash, Dr Rachel Pope and diverse people of all ages taking part in a mighty hug of love and regard for its national importance as a heritage site. “As part of the SAMDev plan Shropshire County Council have voted to classify all sheep in the County as Band C Council Tax payers. This will have the effect of classifying anywhere where the sheep live as housing provision and thus as a Brown Field Site for planning purposes. As Brown Field sites these locations will become eligible for redevelopment immediately under the principle of “Brown Field First”. Our Group’s extensive consultations and alleged business connections, with local farmers and developers [who are not fly by night,although they may be the same thing], show there is a need for three and four bedroom executive homes for sheep which is not being met from the current land allocations. As a result our new planning policy is to have all hillfort sites in Shropshire occupied by sheep living in executive homes by 2025. “We do have some reservations about the building of executive homes for sheep on heritage sites. However, we have accepted the Heritage Impact Assessment written by my colleague’s nine year old nephew who has read Tony Robinson’s “Time Team” books. Lo it shall come to pass that the goode shippe of the Monaco rare coin dealers, which is called Odyssey Explorer, shall pass an entire year of searching the high seas and making port visits without once being accused of breaking maritime laws, going through the motions of looking for wrecks to pump the share price, or being boarded by the Police. But then a great pile of Mexican fertiliser shall once again descend upon the shareholders of Odyssey Marine Exploration, who shall discover that ’tis proven more lucrative to search for treasure than to find it and pay for the recovery, conservation and sale [not to mention ye inevitable lawyers]. And the Master Consultant Mr Stemm shall yet be paid $20,800 per month, plus diverse rich bonuses, for ’tis nice worke if you can get it. And it shall also come to pass that the Maritime Heritage Foundation shall make a genuine attempt to raise money for the excavation of HMS Victory 1744 by recognised maritime archaeologists, thus proving it is a proper independent charity and not a front for Odyssey Marine Exploration/Monaco Rare Coins [delete whichever is not applicable]. “We have a statement from an eye witness, unfortunately now dead, who saw Winston Churchill drive a “Secret Gold Train” into a tunnel under Westminster in June 1940 carrying the currency reserves of the British Empire, whereupon it was sealed in by a mighty conspiracy involving the US Ambassador Joseph Kennedy, MI5 and MI6, the Right Wing of the Conservative Party who did wish to appease Hitler, the Duke of Windsor, and Noel Coward [who sang “Don’t Let’s Be Beastly to the Germans” in a clear attempt to collaborate with the would be Nazi invaders even though he was on the Nazi’s death list]. This incredible evidence also proves that the Winston Churchill who made the speeches was an actor and a double, which is another great conspiracy which the people must be told about. “Audience research shows that Hitler, Nazi’s and UFO’s sell better worldwide than Churchill, so if you can make it a “Nazi Gold Train” which vanished while carrying Hitler and Eva Braun to a secret airfield in the Polish Forest where the Nazi’s test flew UFO’s, we will commission an eight part series at the cost of $16 million [and what remains of our credibility for which we giveth not a monkey’s]. 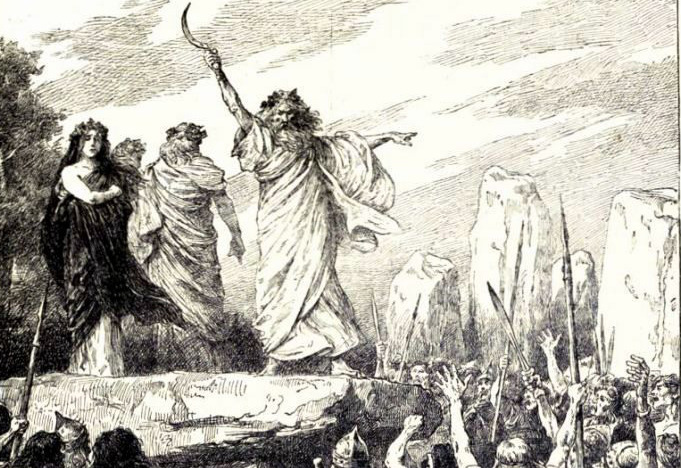 Finally, as the first rays of the midwinter sunrise splashed across the tallest of the Stonehenge Sarsens, the CIfA Seers donned replicas of the Bush Barrow lozenge and began to chant a spell to invoke the spirit of the great antiquarian and chronicler of Stonehenge Mr William Stukeley Esq and celebrate the birth of scientific archaeology. At first all seemed to go well as the last of the smoke from the fire swirled and climbed into the dawn sky appearing to take the form of a man wearing an 18th century wig and Druidic robes. However, all of a sudden, the sky was rent from north to south and from east to west by great forks of lightning and the sound of thunder turned up to level eleven, fit for a wake in memory of Lemmy and the Stonehenge Free Festival. While at the same time, the noxious reek of sulphurous emissions filled the air. Then, before the horrified gaze of the archaeologists the smoke reformed into the shape of Chancellor of the Exchequer George Osborne, wearing nothing except a hard hat and hi viz jacket, flanked by Boris Johnson who was similarly attired. Both leaders were escorted by acolytes from foreign states with dubious human rights records, but much cash from Sovereign Wealth Funds. As the archaeologists watched transfixed, the figure of the Chancellor knelt and delivered the kiss of shame to a great horned beast in yellow and black, manifested in the form of a JCB 360 Degree tracked excavator, which belched out great fiery cheques made out as donations to the Conservative Party from Property Developers, and which struck down in flames any attempt to List buildings or protect conservation areas from overweening tower blocks which eclipse the light of the sun. At this point we understand that the traumatised archaeologists fled the scene so quickly that they even left their trowels and copy of the National Planning Policy Framework Practice Guidance behind. The CIfA would neither confirm or deny that this terrifying apparition had indeed ended the solstice experiment. However, sources close to the participants have told us that a number of those who took part in the experiment were receiving therapy throughout the holiday period and at least one has decided to leave the profession and retrain as an architect. Meanwhile a spokesperson for the senior management of Historic England explained that, while the organisation had some reservations about demonic machines from the deepest circle of hell defining Government planning policy, it stood by the conclusion of its Historic Environment Impact Assessment that any damage to the historic environment done by Satan and all his Fiends was limited and was outweighed by the benefits. We also understand from sources in the media that Yvette Fielding and Derek Acorah have been approached with a view to visiting the site to film an episode of “Most Haunted”, so the story we report above must be true.